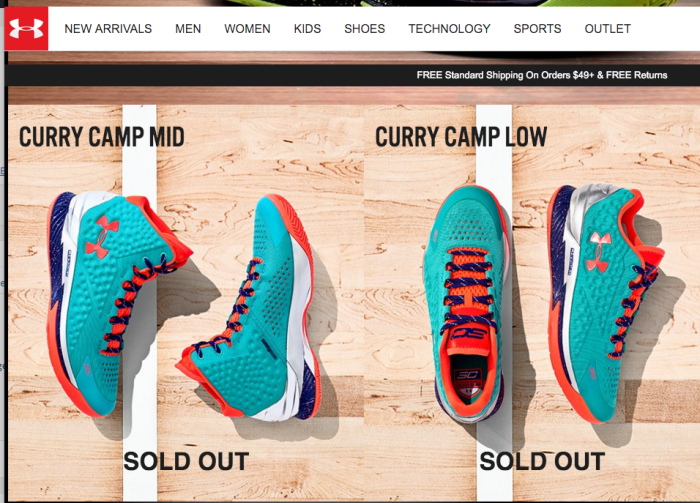 Foot Locker, Under Armour Curry Basketball Shoes, and Mansplaining: How Brick and Mortar Stores Aren’t Winning the Online Retail War. We all know the brick and mortar sales business is tough these days. Everyone is shopping online. Nobody’s going to the mall anymore. But you’ve got a few tricks up your sleeve. Sometimes we want to see the shoes in person, try them on. And we can’t talk to an expert when we’re shopping on a web site. Foot Locker, when a potential customer walks through that door, you’ve got a prime opportunity to win them over with knowledge and keep them coming back. Your business is shoes. Shouldn’t you know more about them than your customers? Yet, consider the Under Armour Curry 1 Camp Mid. You know, that shoe that you rank #3 in Google for? You don’t stock this shoe. So maybe you don’t care about someone asking about it. Except perhaps you should. Customer lifetime value and all of that. 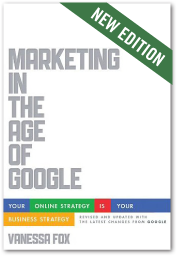 Dazzle the customer with your expertise and service. Those things might cause her to come back to your mall shop the next time she’s looking for shoes. After all, she walked into a version of your store called “House of Hoops”. You know, “hoops”. Like basketball. I get the House of Hoops is all about those Jordans, but still, your employees (especially those in the non-Jordans section of the store) might have heard of other players. Like, I dunno, Steph Curry. That guy who just broke a bunch of NBA records. The face of Under Armour. A company other than Nike that makes basketball shoes. Shoes you sell. 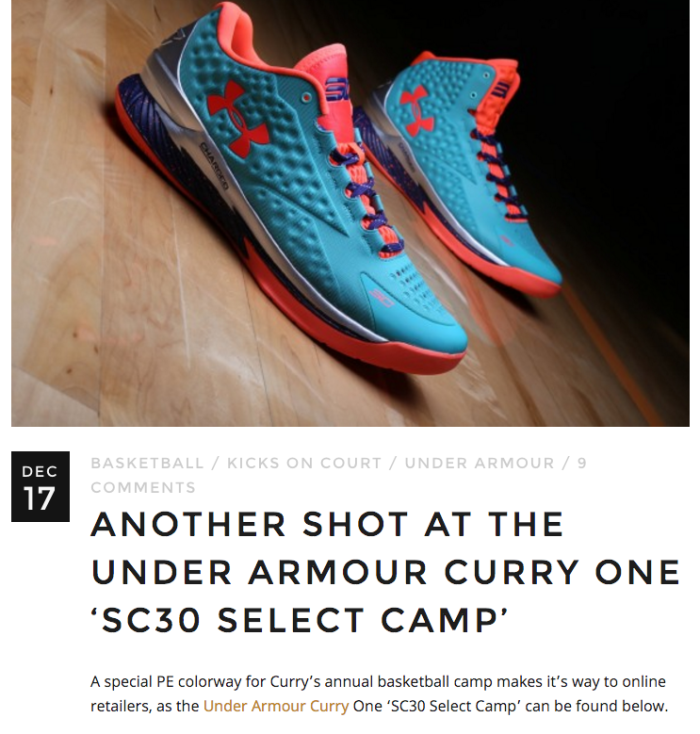 Turns out that a while ago, Curry and Under Armour came out with a shoe called the Curry 1 Camp in a low and a mid. They’re both sold out on the Under Armour web site. You only carry the low. Which I know because I’ve researched this shoe extensively. You see, the shoe is called “camp” because it was released after being produced for Curry’s high school basketball camp. These camps are a thing that basketball players do. If you’re familiar with the story of how Steph Curry ended up making his signature shoes with Under Armour rather than Nike, you might recall that running camps like this was important to Curry, kind a big thing. Foot Locker, if you’re familiar with how the release of basketball shoes work, which one would hope, since you have stores called “House of Hoops”, you know that sometimes, a shoe company will work with a player to create a shoe for some event, like a camp, and then produce the shoe for sale after. They do this for lots of events. Like maybe just an NBA game. The player has a custom pair made but also, the brand decides to produce the shoe commercially. Seems like pretty cool marketing, huh? Mostly, these are called PEs, which stands for “player edition”. You can also find “player exclusives”, but those don’t tend to be commercially produced shoes. A shoe company will make a bunch of special shoes for a player to wear during games and at the end of the season, if he doesn’t need 50 pairs of the same shoe cluttering up his closet, those slightly used shoes might end up at a consignment shop somewhere. So sure, Foot Locker, you’re never going to stock player exclusives, but you probably occasionally stock player editions. A player-edition sneaker is one that is designed for a specific player, and then made available at retail, oftentimes as a quickstrike or limited release. Foot Locker, I was at one of your mall locations and I saw the Curry 1 Camp Low on display. The sales person was hovering (aka, talking to me a lot about his basketball shoe prowess), so in an attempt to be nice I said, I’ve been looking for those in the mid. But they’re just not available anymore. And he said to me, we have them! What’s your size? Oh really? That’s strange. But great! I clarified: you have this shoe but in the mid version? He looked at me blankly. “We have this shoe.” Right, I said. But not the low. the mid. He then explained to me that the shoe was not a mid. It was a low. Right. I tried to explain to him that Under Armour had also produced a mid. As Shakespeare once said, there are more things in heaven and earth, Foot Locker, than are sold in your particular store. And then began the mansplaining. You know the kind of thing. Where someone who has never heard of a particular shoe explains it in detail to someone who introduced the concept of that shoe to the mansplainer? First, he challenged my notion that such a shoe existed. Perhaps I only wished there were a mid? Girls are prone to flights of fancy, after all! (I am paraphrasing.) I showed him the shoe on the StockX app on my phone. That didn’t deter him a bit as he had never heard of the go-to app for basketball shoes, despite presenting himself (quite strongly) as a basketball shoe expert. Perhaps I should have referred him to the Ted talk the founder gave about the basketball shoe market to provide some credibility but instead I let him keep talking. He explained (ahem). Just because I’ve seen a shoe online doesn’t mean it exists. You see, sometimes shoes are made just for players. Silly little girl, I can’t buy those shoes in stores! And if I find them for sale online someplace, they’re going to be used shoes! Worn at least 7 times by the players in question! This, he explained in great detail to the woman WHO HAD AN APP FOR BASKETBALL SHOES ON HER PHONE. I let him explain more to me about the shoe he’d never heard of until I mentioned it, smiled, and left the store. So Foot Locker, this is possibly not the best example of how to show the added value of visiting an old timey brick and mortar store. Foot Locker’s House of Hoops may not be the first place I think of the next time I’m looking for hoops-related shoes. 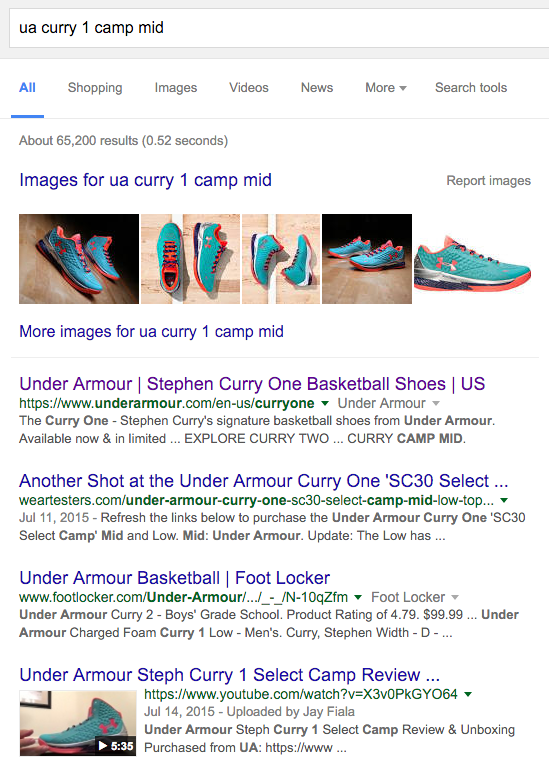 But if anyone else other than Foot Locker is reading this and has any inside info on copping a pair of deadstock Curry Camp Mids (that doesn’t involve mansplaining how they don’t exist), hook a girl up!